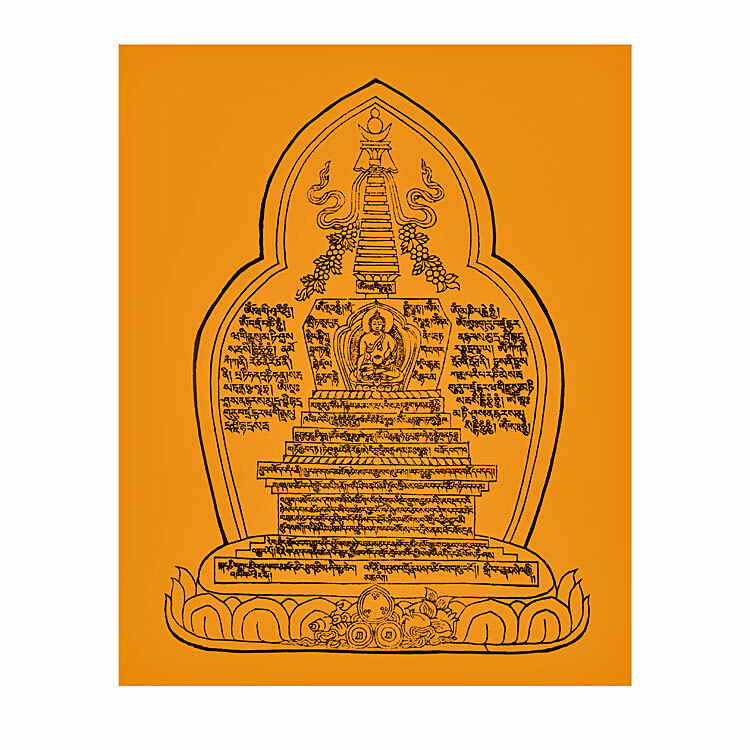 "It is extremely important to have an image of this stupa with mantras because its benefits of giving protection come from Lama Atisha of Nalanda, where there were 300 great scholars and holy beings. "The purpose of keeping an image of this stupa in your house or in your room is to protect you from the mental pollution, not yet discovered in the West, from those who, in particular, have broken samaya with their guru, belittled their guru, given rise to heresy or anger towards their guru, or who, after making a Dharma connection through receiving a lung, commentary, initiation, or vows, gave up their guru. These create so much mental pollution, which is the heaviest negative karma. "If you meet, talk to, or receive teachings from that person, or bring other people to a place where that person has been, your mind gets polluted. You lose your spiritual achievements, your mind becomes more negative, it becomes more difficult for you to achieve realizations, and you get reborn in the lower realms. It is very dangerous. "Also, the places where that person has been become polluted. The previous Kyabje Zong Rinpoche told us, during the First Dharma Celebration, that even the tap water in a place where that person has been becomes polluted. If you drink it, you get polluted, you lose any spiritual progression you have made, your mind degenerates, and you go to the lower realms. "The external pollution from a car doesn’t cause you to be reborn in the lower realms, but this pollution does. "You can also wear the image of this stupa as a protection amulet so that wherever you go, you are protected from this pollution. "This is very important. It would be good for every FPMT center, service, and project to have this image in its gompa, office, or other public rooms, and on every level of its buildings. "If you are new to Buddhism and don’t understand this, it doesn’t matter; just keep it in your room for the benefit of other people." 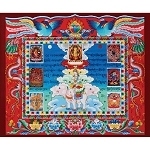 Wear Lama Atisha's Protection Stupa on the body or display it in your house. Read more about the history of the image and its benefits here. For wearable amulet click here. Lama Zopa Rinpoche advice on wearing protection items: "When you wear the protection, you can wear it in the shower if it has a plastic cover on it. Then, the shower is not a problem. The worst thing is if you wear a picture of a Buddha or His Holiness the Dalai Lama around your neck and then when you go to sleep it goes down under your arm or your body. If you wear it when you lie down, then that is creating negative karma. Therefore, it is good to take it off when you lie down at home or whenever you are doing activities which are disrespectful to Buddha, including lying down or having the buddha under your body. If you don't pay attention this can happen." 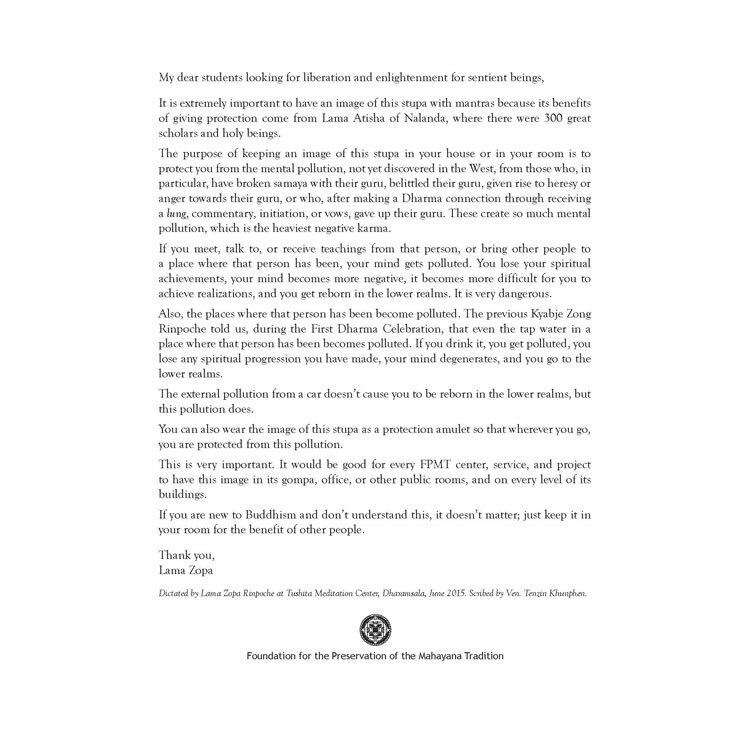 Proceeds from the sale of this download will go to FPMT's Stupa Fund, which supports Lama Zopa Rinpoche’s vast vision of constructing 100,000 stupas around the world for world peace.